If Brandon Mull taught a writing course, I'd be the first to sign up! Brandon Mull has become one of my top 3 favorite YA authors. His imagination, his ability to keep a story moving and his sense of humor have made me one huge fan. From Fablehaven to Beyonders and now Five Kingdoms, we have 3 winners. Plus, Mr. Mull promises another book in the Candy Shop Wars series as well as the continuance of Dragonwatch. Doing the happy dance. If you're looking for a great series with plenty of adventure, fun and funny characters, lots of action and good wholesome entertainment, this is it. The whole family can enjoy these books and anything else Mr. Mull has written. So I first picked up this series just after the second book came out and I absolutely loved it. The worldbuilding was great and the characters all had so many layers. It quickly became one of my favorite series and Brandon Mull, one of my favorite authors (highly recommend Fablehaven and Dragonwatch). All of the books were absolutely phenomenal. This book was no exception. It ended on a very high note and left me nearly crying that it was over. I will not give too many spoilers, but the only thing I didn't like about it was how fast the book was moving in the first half. Once they met Lorenzo, it got so much better. Very much worth it. Don't regret it. 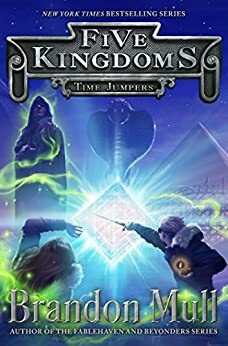 I first heard of Brandon Mull from the editor of my story, Ethan and the Key, who told me that she felt my story would appeal to many of the same readers. So my high-school daughter and I read the whole series together, and we both found all five books to be very enjoyable. This series does a terrific job of hooking you right away; what higher stakes could there be than a group of middle-school trick-or-treaters being kidnapped to a world called the Outskirts and sold into slavery? The overriding question of the series is, will Cole Randolph (the POV character) and all his friends make it back to Mesa Arizona? You are left wondering, right up until the end, how it will all turn out. The characters are very well developed; by the end of the series, you feel like you went to middle-school with them. The only problem I had with the series is that there is a lot of exposition. There are many long passages and even whole chapters, devoted to conversations in which various characters explain to Cole how things work in the Outskirts. If you like learning about how new worlds work, this won’t bother you and may even add to your enjoyment of the stories. However, I get impatient with exposition. Overall, this series of books is a very entertaining adventure. So, if you like stories with fun characters and imaginative new worlds, I highly recommend this series of books. I started reading Brandon Mull's books in about third grade, starting with Fablehaven. That series became my favorite and I would often reread favorite parts from the books when the mood struck me. As time went on, I discovered The Candy Shop War, The Beyonders books, and continued to enjoy Mull's stories and worlds. I have definitely outgrown the target audience for his books, but I still come back to them and get excited when I hear of a new book that is coming out. The Five Kingdoms series has been really enjoyable and imaginative. Mull creates worlds and characters that you can't help being immersed in. This final book of the series is a very satisfying conclusion, though it is definitely bittersweet. I have a feeling that I will be thinking about for a little while. The publishing date was pushed back in order to make this book the best that it could be, and I believe that the decision worked out. I don't want to talk too much about the book to risk spoiling anything, but overall I really enjoyed it. This series is perfect for kids. It is full of imagination, adventure, and fun. It also reads well for an adult as a something quick and fun. I would love to read these sorts of books to my kids one day. 5.0 out of 5 starsI HAVE BEEN DYING TO READ THIS BOOK!!!!!! Jaw literally dropped. I am 12 years old and at school ( Christmas 2015 ) we had a book exchange. A friend got me book 2 and I IMMEDIATLY fell in love with the series. Every book is entertaining, whether it's your first time reading it or your tenth. Ever since summer 2016, I have been waiting for this book. 100%, ABSOLUTELY worth the wait. I have read the Five Kingdoms, Beyonders, and Fablehaven series ( including Dragonwatch ) and they are all INCREDIBLE. I can hardly think of an author I prefer more. I have recommended this series to my siblings, but none of them even finished book one, much to my dismay. This book is definately worth it's cost. Any fan of Harry Potter, the Hunger Games, or The Maze Runner will not be able to put this book down. Case closed.